Governor Brownback declared April to be Financial Literacy Month in Kansas. Yes, that’s true, although unbelievably ironic given the state’s current financial condition. Here’s one of his solutions: Make only three quarterly payments into the retirement system this year, but promise to make the fourth payment next year, or the year after. Kansans, try that kind of maneuver with your personal finances and see what happens. Call your mortgage company and say you just can’t make 12 house payments this year, so you’ll do 11, but promise, promise, promise that next year you’ll do 13. Don’t expect to win an I-pad mini. 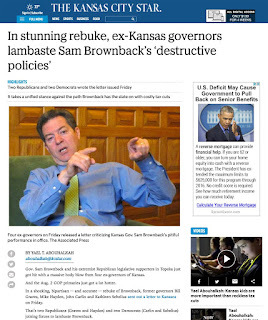 —This post originally ran in a variety of Kansas newspapers last weekend.